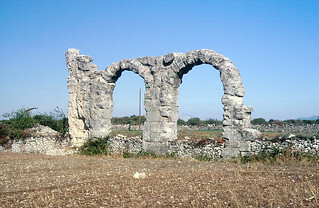 The site (which is also known as Šuplja Crkva) famously possesses the remains of three arches which may belong to the cross-hall of the headquarters building of the fortress. It is only fair to mention that they may also belong to the basilica of the later forum on the site, for the fortress becmae a colonia. Much jiggling of plans and scratching of head has failed to resolve this for certain. Other portions of unconsolidated masonry could be seen during ground inspection of the site in 1987. The fortress (and colonia) amphitheatre has been excavated and consolidated, as has a portion of what may be the training ground next to it. The fortress is within the Krka national park and the Burnum Archaeological Museum in nearby Puljani has a fine display of material from the site (PDF brochure). There is a good Croatian* Wikpedia entry for the site (the English version, as usual, lags behind). There is also a useful little article on the history of the site. There are also a general tourist website in English, another with a low-level oblique aerial photo of the arches, and a site detailing the quest for the aqueduct supplying the fortress/colonia. * Note that for those who do not read Croatian, the Chrome browser offers the facility to translate web pages.